Sometime this year iriver, which will soon change its name to MouseComputer, will release its very own e-book reader in Japan. It’ll be called the Libre, and it’ll probably be priced around ¥29,800 ($312). Like every other e-book reader on the planet, it’ll use eInk. Unlike the Amazon Kindle, it won’t be able to transfer books via any sort of wireless connection; it only transfers data via USB. Iriver is currently negotiating with Japanese newspaper companies… you know, to help ship the device with any sort of content. 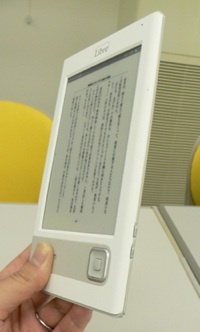 The six inch-screen has a resolution of 800×600.